If you asked anyone at the NAHS Homecoming Dance if they were having fun, everyone would have responded with an overwhelming “YES,” except around 8:30 pm. 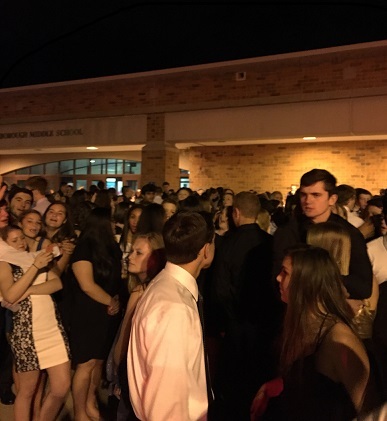 Over 570 students were dancing the night away in the school’s gymnasium when, during an upbeat dance song, the fire alarm went off. Students evacuated the building as quick as possible and stood outside of the Middle School across the street in the 42-degree weather. “It was quite unexpected, and it was just coincidental because it was so cold out. We had to huddle together like penguins,” said senior Abigail Rodriguez. After the fire alarm was turned off and firefighters finished their jobs, the crowd filed back into the gym for another hour of dancing. The dance was an overwhelming success, proving that the students of NAHS know how to make light of a bad situation and move on from it. “After the alarm, the DJ’s choice of song including–‘Fire Burning’–was great,” remarked senior Shannon Kingsley. The dance of 2015 proved to be quite a memorable one, and our school became closer because of it. We will have to stay tuned for what the homecoming dance of 2016 has in store for next year.